The Otavalo market consists of mushroom-shaped concrete umbrellas with benches. The market was designed and built in 1970 by Dutch architect Tonny Zwollo. 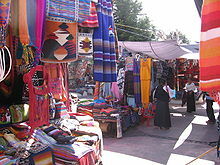 During the market's peak, almost one third of the town becomes full of stalls selling textiles, tagua nut jewelry, musical instruments, dream catchers, leather goods, fake shrunken heads, indigenous costumes, hand-painted platters and trays, purses, clothing, spices, raw foods and spools of wool. As the city has become more of a tourist attraction, many of the goods sold in the markets are mass-produced in nearby factories and sold in the market by middle-men. More artisan products can be purchased in neighboring communities or at the Museo Viviente Otavalango. This article uses material from the Wikipedia article "Otavalo Market", which is released under the Creative Commons Attribution-Share-Alike 3.0 License.